Pendleton Blanket: Keep a blanket in your trunk for improptu picnic occasions. Pendleton has made a revival but I'll stick with my vintage one courtesy of Mom and Dad's closet. Be sure to check out their state park edition blankets! A Seriously Swanky Picnic Basket : This particular luxe model is from Loewe, but even places like Pier 1 have baskets similar to this one. And you can always bedazzle it. Look for baskets that tether down glasses and plates. Needlepoint Flask: For an evening picnic, perhaps some libations are in order. I'm going to advise against bringing the actual liquor bottle, but add your cocktail zing to a flask for easy carrying. The needlepoint is classic Smathers and Branson but there are many metal monogram worthy flasks that are classic options. Sweet LuLu Eco-friendly Spoons: I personally try to avoid one use items, but there are times when disposable is okay. These colorful chevron spoons could be the right option for a sticky dessert. Tervis: If you don't know about Tervis for tailgating and other outdoor merrymaking, you are missing out. Tervis tumblers are well insulated for both hot and cold drinks and virtually indestructible. There are so many designs to choose from. We have a college JMU set. Mint Color Straws: Some drinks need straws and stirrers. Opt for these biodegradable straws which come in a ton of colors and designs for something fun. 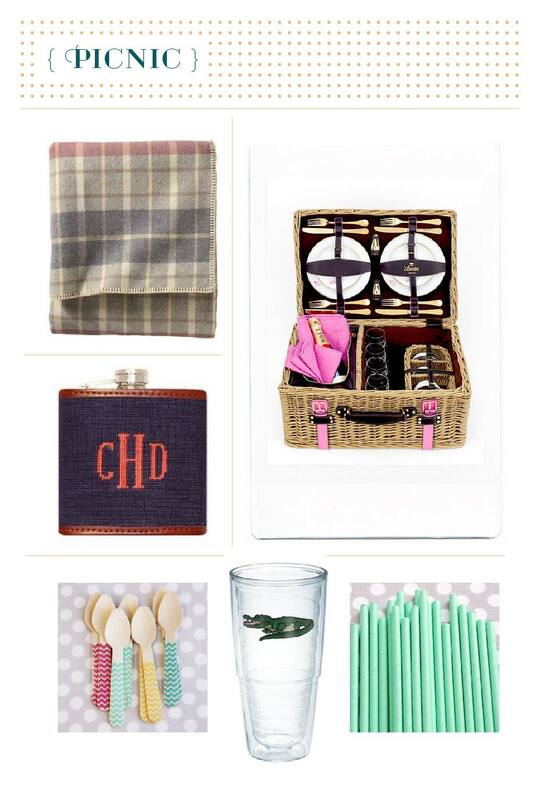 What's in your must have picnic basket?